A component provides a way of defining a new visual item that you can re-use in other QML files. A component is like a black box; it interacts with the outside world through properties, signals, and slots, and is generally defined in its own QML file. You can import components to applications. The Library pane lists the available QML types, UI components, resources, and imports. The QML Types tab displays the QML types grouped by category: your own QML components, basic types, layouts, positioner types, and views. Sets of UI components with the look and feel of a particular mobile device platform have been defined for Qt Quick 1. Since Qt 5.1, ready-made Qt Quick Controls, Dialogs, and Layouts are available for creating user interfaces using Qt Quick 2. The components and controls are based on standard QML types. To view the components and controls in the Library, import the component sets in Imports. Resources displays the images and other files that you copy to the project folder (to the same subfolder as the QML files). Drag and drop components from the Library (2) to the Navigator (3) or Form Editor (1). Select components in the Navigator to edit their properties in the Properties pane (4). For more information, see Specifying Item Properties. Connect components to signals or create bindings between components in the Connections pane (5). For more information, see Adding Connections. Add states to apply sets of changes to the properties of one or several components in the States pane (6). For more information, see Adding States. Border Image uses an image as a border or background. Image adds a bitmap to the scene. You can stretch and tile images. Item is the most basic of all visual types in QML. Even though it has no visual appearance, it defines all the properties that are common across visual types, such as the x and y position, width and height, anchoring, and key handling. Rectangle adds a rectangle that is painted with a solid fill color and an optional border. You can use the radius property to create rounded rectangles. Text adds formatted read-only text. Text Edit adds a single line of editable formatted text that can be validated. Text Input adds a single line of editable plain text that can be validated. Grid View provides a grid vizualization of a model. List View provides a list vizualization of a model. Path View visualizes the contents of a model along a path. Scroll View provides scrolling for user-defined content. It can be used instead of a Flickable item. Stack View provides a stack-based navigation model. Swipe View enables users to navigate pages by swiping sideways. When you add a Grid View, List View, or Path View, the ListModel and the delegate component that creates an instance for each item in the model are added automatically. You can edit item properties in the Properties pane or in the Text Editor. You can also replace the default model and delegate with other, more complex models and delegates in the Text Editor. Item Delegate and Swipe Delegate delegate components are also available in the Library. The Binding Editor supports code completion. Start typing a string and press Ctrl+Space to display a list of properties, IDs, and code snippets. When you enter a period (.) after a property name, a list of available values is displayed. Press Enter to accept the first suggestion in the list and to complete the code. 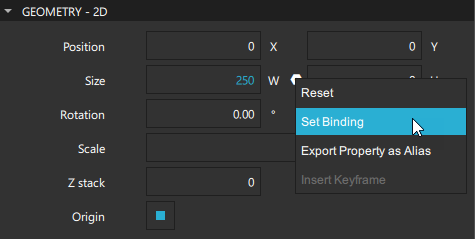 To remove bindings, select Reset in the context menu. You can set bindings also in the Connections view. For more information, see Adding Bindings Between Properties. Bindings are a black box for the Design mode and using them might have a negative impact on performance, so consider setting anchors and margins for items, instead. For example, instead of setting parent.width for an item, you could anchor the item to its sibling items on the left and the right. In an anchor-based layout, each QML type can be thought of as having a set of invisible anchor lines: top, bottom, left, right, fill, horizontal center, vertical center, and baseline. In the Layout pane you can set anchors and margins for items. To set the anchors of an item, click the anchor buttons. You can combine the top/bottom, left/right, and horizontal/vertical anchors to anchor items in the corners of the parent item or center them horizontally or vertically within the parent item. For convenience, you can click the (Fill to Parent) toolbar button to apply fill anchors to an item and the (Reset Anchors) button to reset the anchors to their saved state. You can specify the baseline anchor in the Text Editor in the Design mode. For performance reasons, you can only anchor an item to its siblings and direct parent. By default, an item is anchored to its parent when you use the anchor buttons. Select a sibling of the item in the Target field to anchor to it, instead. Arbitrary anchoring is not supported. For example, you cannot specify: anchor.left: parent.right. You have to specify: anchor.left: parent.left. When you use the anchor buttons, anchors to the parent item are always specified to the same side. However, anchors to sibling items are specified to the opposite side: anchor.left: sibling.right. This allows you to keep sibling items together. In the following image, Rectangle 2 is anchored to Rectangle 1 on its left and to the bottom of its parent. Margins specify the amount of empty space to leave to the outside of an item. Margins only have meaning for anchors. They do not take any effect when using layouts or absolute positioning. Column arranges its child items vertically. Row arranges its child items horizontally. Grid arranges its child items so that they are aligned in a grid and are not overlapping. Flow arranges its child items side by side, wrapping as necessary. To lay out several items in a Column, Row, Grid, or Flow, select the items on the canvas, and then select Layout in the context menu. Since Qt 5.1, you can use QML types in the Qt Quick Layouts module to arrange Qt Quick items on screens. Unlike positioners, they manage both the positions and sizes of items in a declarative interface. They are well suited for resizable user interfaces. Layout provides attached properties for items pushed onto a Column Layout, Row Layout, or Grid Layout. Column Layout provides a grid layout with only one column. Row Layout provides a grid layout with only one row. Grid Layout provides a way of dynamically arranging items in a grid. Stack Layout provides a stack of items where only one item is visible at a time. To lay out several items in a Column Layout, Row Layout, Grid Layout, or Stack Layout, select the items in the Form Editor, and then select Layout in the context menu. You can also click the (Column Layout), (Row Layout), and (Grid Layout) toolbar buttons to apply layouts to the selected items. To make an item within a layout as wide as possible while respecting the given constraints, select the item on the canvas and then select Layout > Fill Width in the context menu. To make the item as high as possible, select Fill Height. To add items to a Stack Layout, select the button next to the type name in the Form Editor. To move between items, select the (Previous) and (Next) buttons. To add a tab bar to a stack layout, select Stacked Container > Add Tab Bar. To raise or lower the stacking order of an item, select Stacked Container > Increase Index or Decrease Index. Frame places a logical group of controls within a visual frame. Group Box is used to lay out a logical group of controls together, within a titled visual frame. Label is a text label with inherited styling and font. Page provides a styled page control with support for a header and footer. Page Indicator indicates the currently active page. Pane provides a background matching with the application style and theme. Flickable items can be flicked horizontally or vertically. Focus Scope assists in keyboard focus handling when building reusable QML components. Mouse Area enables simple mouse handling. Busy Indicator indicates activity while content is being loaded. Button provides a push button that you can associate with an action. Check Box provides an option button that can be toggled on (checked) or off (unchecked). Check Delegate presents an item delegate that can be toggled on (checked) or off (unchecked). Combo Box is a combined button and popup list that is populated by using a data model. Delay Button provides an option button that is triggered when held down long enough. Dial is a circular dial that is rotated to set a value. Progress Bar indicates the progress of an operation. Radio Button provides an option button that can be switched on (checked) or off (unchecked). Radio Delegate presents an item delegate that can be toggled on (checked) or off (unchecked). Range Slider enables users to select a range of values by sliding two handles along a track. Round Button provides a push button with rounded corners that you can associate with an action. Slider selects a value by sliding a handle along a track. Spin Box enables the user to specify a value by clicking the up or down buttons, by pressing up or down on the keyboard, or by entering a value in the box. Switch is an option button that can be toggled on or off. SwitchDelegate presents an item delegate with a switch indicator that can be toggled on or off. Tab Bar enables users to switch between different views or subtasks. Tab Button is a button that is functionally similar to Button, but provides a look that is more suitable for a Tab Bar. Text Area displays multiple lines of editable formatted text. Text Field displays a single line of editable plain text. Tool Bar is a container of application-wide and context sensitive actions and controls, such as navigation buttons and search fields. Tool Button is a button that is functionally similar to Button, but provides a look that is more suitable for a Tool Bar. Tool Separator separates a group of items from adjacent items on a Tool Bar. Blend merges two source items by using a blend mode. Blur applies a fast blur effect to one or more source items. Brightness Contrast adjusts brightness and contrast. Color Overlay alters the colors of the source item by applying an overlay color. Colorize sets the color in the HSL color space. Directional Blur applies blur effect to the specified direction. Drop Shadow generates a soft shadow behind the source item. Gamma Adjust alters the luminance of the source item. Glow generates a halo-like glow around the source item. Hue Saturation alters the source item colors in the HSL color space. Mask masks the source item with another item. Masked Blur applies a blur effect with a varying intesity. Radial Blur applies directional blur in a circular direction around the item's center point. Saturation reduces the saturation of the colors. Zoom Blur applies directional blur effect towards source item's center point. You can use the project wizard to create a starting point for a custom Button, Pane, Stack View, or Switch. Select File > New File or Project > Files and Classes > Qt Quick Controls. Select the control to create, and then select Choose. Note: Components are listed in the QML Components section of the Library only if the filename begins with a capital letter. Edit component properties in the Properties pane. The available properties depend on the QML type. A set of ready-made studio components are available for creating differently shaped objects, such as arcs, pies, or triangles, as well as objects with particular abilities, such as being visibly flipped between their front and back sides, like a card. Some of the components are based on basic QML types with some additional properties that make them more versatile. Arc adds an arc that begins and ends at given positions. Border adds a border with corners that you can shape independently of each other. Flipable provides a surface that can be flipped. Iso Icon adds a container for an ISO 7000 icon. Pie adds a pie slice or a pie with a slice missing from it. Rectangle adds a rectangle with corners that you can shape independently of each other. Svg Path adds an SVG path. In Qt 4, ready-made Qt Quick 1 Components were provided for creating screens with a native look and feel for a particular target platform. 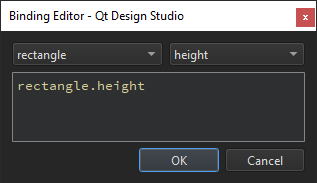 In Qt 5.1, Qt Quick Controls, Dialogs, and Layouts were added for creating classic desktop-style user interfaces using Qt Quick 2.1. The Qt Quick Controls Styles could be used to customize Qt Quick Controls. Since Qt 5.7, Qt Quick Controls 2 replace Qt Quick Controls 1 and Qt Labs Controls. They provide lightweight QML types for creating performant user interfaces for devices. Qt Quick Controls 2 achieve improved efficiency by employing a simplified styling architecture when compared to Qt Quick Controls, on which the module is based. The visual editor reads the qtquickcontrols2.conf file that specifies the preferred style and some style-specific arguments. To change the style, select another style from the list on the toolbar. This enables you to check how your UI looks when using the available styles. For an example of defining your own style and using it in the Design mode, see Qt Quick Controls 2 - Flat Style. Qt Quick Controls 2 work in conjunction with Qt Quick and Qt Quick Layouts. The Qt Design Studio project wizards create Qt Quick applications that use Qt Quick 2 types or Qt Quick Controls 2 types. Even if you use Qt Quick Controls 2, you can still write cross-platform applications, by using different sets of QML files for each platform. Some ready-made controls, such as a gauge, dial, status indicator, and tumbler, are provided by the Qt Quick Extras module. Select File > New File or Project > Qt Quick Files > Qt Quick File > Choose to create a new .qml file. Click Design to open the .qml file in the Design mode. Drag and drop a QML type from the Library to the Navigator or Form Editor. Edit its properties in the Properties pane. Components can consist of several other components. To view the component hierarchy as a bread crumb path when you edit a component on the canvas, select Go into Component or press F2. Click the component names in the path to navigate to them. You can easily navigate back to the top level when you are done editing the component.